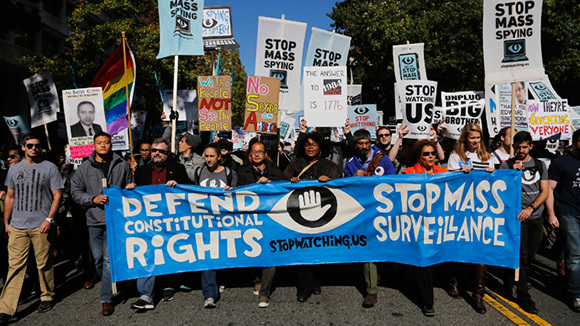 Several thousand marched and rallied in the nation’s capital on October 26 in protest of the mass surveillance of virtually all Americans and hundreds of millions of citizens of other countries. 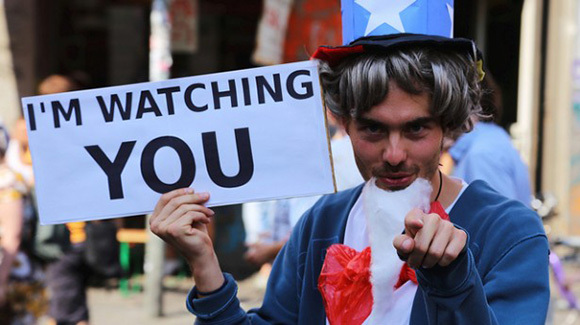 The massive Big Brother program, conducted by the U.S. National Security Agency (NSA), has been exposed by Edward Snowdon, the hero of the demonstration. Begun last summer (in the northern hemisphere), Snowden’s trove of revelations keeps coming through releases by Glen Greenwald of the British Guardian. “Thank You, Edward Snowden,” was the most popular banner among the crowd. One member of the feminist group Code Pink wore an Obama mask, and carried a large cardboard camera. Organizers supplied placards reading “Stop Watching ________,” allowing protesters to fill in their names. Homemade signs were more colorful. Some were, “Don’t Tap Me, Bro,” “Yes, We Scan,” and “No Snitching Allowed.” One protester wore a mask depicting a skull beneath the head of the Statue of Liberty. Another carried a large model of a U.S. drone aircraft. A message from Snowden himself, from his in exile in Russia, was read to the rally, by Jessica Radack, a former Justice Department ethics advisor. She left that job, no doubt tired of butting her head against the wall, and now is with the Government Accountability Project. “We are here to remind government officials,” Snowden’s statement began, “that they are public servants, not private investigators. This isn’t about red or blue party lines, and it definitely isn’t about terrorism. This is about the unconstitutional, unethical and immoral actions of the modern-day surveillance state and how we must all work together to remind the government to stop them. It’s about our right to know, our right to associate freely, and to live in a free and open democratic society. “We are witnessing an American movement in which ordinary people from high schools to high office to stand up to oppose a dangerous trend in government. We are told that what is unconstitutional is not illegal, but we will not be fooled. We have not forgotten that the Fourth Amendment in our Bill of Rights prohibits government not only from searching our personal effects without a warrant, but from seizing them in the first place, and doing so in secret. This was “for coming out of the system to speak truth to and of power – clearly a dangerous act of civil disobedience and individuality, for sure, in these times, and now defined as a criminal act by the national security state, aided and abetted by journalists and reporters – expressing one’s fundamental and inalienable right to individual sovereignty in the face of a government bent on destroying it. Another speaker was Gary Johnson, former Republican governor of New Mexico, and the 2012 presidential candidate of the Libertarian Party. Unlikely as it seems, there is a tiny minority of Republicans who actually support the Bill of Rights, while right wing on other issues. “The government has granted itself power that it does not have [under the Constitution],” Johnson said. “We have to stand against this. 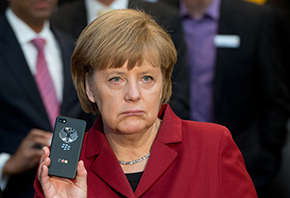 The demonstration came amid new revelations about massive NSA spying of French and Spanish citizens, as well as the more sensational news about the bugging of the German Chancellor’s phone going back to 2002. These come on top of previous revelations of massive spying on Mexico and Brazil, and of their leaders, too. There has been outrage in Europe. Why then was the October 26 demonstration only in the thousands, important as it was? The second reason why the turnout wasn’t larger was the failure of the demonstration organizers to try to mobilize a wider layer. I am on many left lists, including socialist ones but left-liberal ones also. I did not see one single announcement of the action, which I only heard about after it occurred. It appears the organizers made no effort to appeal to socialist or antiwar groups. These were conspicuous by their absence, by and large, with the exception of some members of the Code Pink antiwar organization. Press reports also mentioned that there were some Green Party people present. But well known Code Pink spokesperson Medea Benjamin did not speak. Nor did Jill Stein, presidential candidate of the Green Party in 2012. Nor did anyone from the United National Antiwar Coalition, or the ANSWER coalition. Not even Amy Goodman, the host of Democracy Now!, was invited to speak. This in spite of the fact that this show has been one of the best sources of coverage of Snowden, Greenwald and the NSA since the first revelations. Many of the quotes of speakers at October 26 in this column come from Democracy Now!’s coverage of the action, which was barely mentioned in the capitalist press and media, if at all. It appears that the organizers didn’t want to have much of the left present. If they had, the actions could have been perhaps two or three times larger. 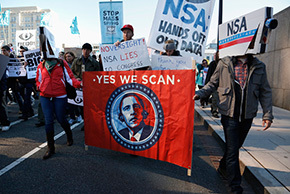 But the main reason why the action wasn’t much bigger is the fact that large numbers who are appalled at the NSA spying fear to do anything that is directed at the Obama administration and the Democrats, as this action was. The White House full-blast offensive backing the NSA is truly grotesque. One example: testifying before Congress (and on prime time TV) in the days after the October 26 action, NSA Director Gen. Keith Alexander even charged the French newspaper Le Monde, the Spanish newspaper Il Mundo, the German Der Spiegel and others with spreading falsehoods about the spying on their citizens. So while figures in the administration have gone on the offensive to justify the whole NSA program, the many millions opposed to that very program remain impotent and silent. Among them is the MoveOn organization, which purports to represent “progressive” Democrats and was silent on the demonstration, and steers clear of Snowden. Such is the logic of lesser-evilism, the fear to oppose the Democratic administration on anything so as not to look pro-Republican. It is a fateful trap. Let’s hope that October 26 is the beginning of a breakthrough.